Due to the large number of requests I get about how I make my beef jerky, I'm going to tell you a little about it. First of all and this is very important, all my beef jerky is made from "grass - fed" beef! Period! Cavemen made jerky from buffalo, antelope, deer, elk, rabbit, or whatever else they could bring down. As long as the meat is lean, it will turn into jerky when properly treated. Fatty meat won't make jerky, as the fat will go rancid quickly. Prehistoric jerky was either sun-dried or hung down-wind from the campfire. The smoke kept the flies off it and they found out that it tasted really good. Jerky is simply meat with all the moisture removed. It's one of the oldest known forms of preserving food. As long as it's kept dry, jerky has a shelf life longer than a loaf of commercial white bread full of preservatives. No self-respecting cowboy, hunter, or explorer would be ever be caught dead without a few sticks of jerky in his pockets. Too bad I wasn't around then, eh? Now, me, I invented my own process. I put the meat together with the spices and water or wine, they tumble together so the meat absorbs the flavor inside and out, When you chew a piece of my jerky, you get all the flavor, not just on the outside like you taste with chewing gum- all the flavor on the outside, no taste on the inside. Then, I lay the meat on trays, add more of the same spices on both sides and smoke it. If I told you how long they tumble or how long I smoke it, I'd be giving away my secret! And finally, if you find anyone else's jerky that tastes better than mine, email me, I wanna talk to them. So there you have it! 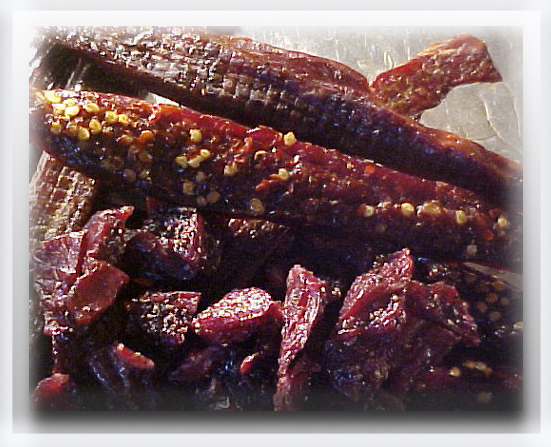 I make nine types of Beef Jerky - Teriyaki, Teriyake Pepper, Black Pepper, Hot Pepper, BBQ, Cajun, Garlic, Plain, and VIP (with white wine and a touch of Hot Pepper) and two of Turkey Jerky - Teriyaki and Hot Teriyaki, which I sell for $30.00 per lb. (which is a lot of jerky) and I send it vacuum sealed in one quarter pound packages- not only for freshness but who the heck wants to pay for air?